I can’t help but feel a little taken aback when I read threads on various crafting forums about knitting in public. Why? Because I totally can’t relate to all the “I can’t do any knitting in public because my spouse/partner/significant other gets embarrassed” posts there are. Ok, so this wasn't overly public - this was a cookout in the snow back in 2011. 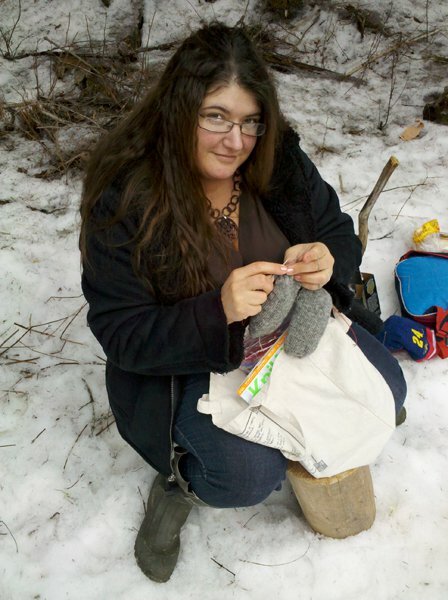 But yes, I brought my knitting and worked on socks while the guys stalked through the woods in search of whatever wildlife they could find. Seriously, I can’t think of a time when my husband got upset because of my public knitting – what’s there to be embarrassed about? I can hold a conversation, look people in the eye, be aware of and tuned into my surroundings – AND I can produce copious amounts of knit items – or tatted, or poorly-done crochet. I know it’s not considered normal behavior by non-crafters…people who don’t spend time making things with their hands don’t understand the urge to cast on the next project, and they certainly don’t understand how very naked it feels to be standing there in a line or sitting in a waiting room without SOMETHING to make. Add that to all of the “wow, my grandmother used to do that” and “oh, that is a lost/dying art!” and “aren’t you too young to do that?” and yes, those of us who craft in public have to develop a thick skin. So I suppose I can see why some people’s spouses would get embarrassed by the attention and remarks that crafting in public brings…but I’m very glad mine isn’t one of those! Instead, he’s more likely to tell people what it is that I’m making, and even describe the yarn. He brags on my handknits to his friends, and he wears the things I make him even in public. Yes, he may laugh and roll his eyes when we meet up with other knitter friends, as we sit down in a restaurant and handbags open and knitting projects make their appearance – but he’s only laughing because he thinks my OCD is a little on the funny side 😉 Besides…he wants more socks. And if I don’t use those odd bits of time to make them, he’d never have any! I’m curious – does *your* significant other have issues with you knitting in public? Would it stop you if they did? or would you manage to persuade them that it was ok?